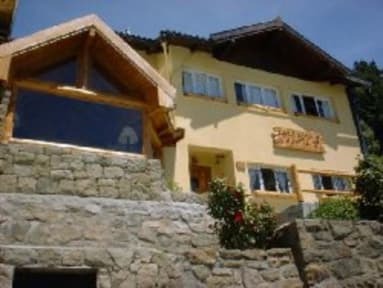 This hostel, fully and completely managed and cared for by its owners, is a traditional mountain house located in downtown San Carlos de Bariloche, just a few blocks from the Nahuel Huapi Lake. This, we are proud to say, is the only hostel in the whole city that can give you an excellent view to this great lake that commands the whole city's sightseeing and landscape. We know what it is that you expect from a hostel, because we have travelled and slept in hostels around the world. That is why we keep a limited lodging capacity. And why we always go the extra mile to provide you with simply the best service you need while you are away from home. Every room has its own private bathroom. And as you want it, your room will be comfortable, clean - just as the common areas do as well. But our goal at Bariloche Hostel is much more ambitious than that. We want this lodge to be your doorway to Patagonia. So we offer you a variety of sightseeing trips, mountaineering services, and extreme sports (if you care to try them) for you to discover the true human adventure that can be only experienced at one of the few last corners of this planet where nature is still running wild and virgin.